A slender dark beetle with metallic green highlights has been decimating ash trees in a number of states and Canada. This month the U.S. Forest Service announced the Emerald Ash Borer had been found east of the Hudson River, the last natural obstacle before it reaches the forests of New England. As they prepare for the insect’s arrival, federal and state agencies mobilized in Vermont this week to conduct an exercise designed to slow its spread. Vermont officials say it’s not a matter of ‘if’, but ‘when’ the Emerald Ash Borer is found here. Thursday’s exercise in an area around Randolph was designed as a shakedown drill on how to respond when it is. The idea is to quickly mobilize a rapid response team to fan out around the infected area and map it with an eye toward controlling the insect’s spread. Teams armed with maps, binoculars and GPS units took to the roads, fanning out over a five mile radius from where a hypothetical ash borer was found. In the field the teams practiced looking for tell tale traces of the insect: Like certain excavations by woodpeckers. Team member Jordan Fletcher, explains, "We’re also looking for dieback in the canopy or a lot of people call them watershoots or watersprouts coming from the bottom of the tree. Then ultimately what you’re looking for is the gallery, these serpentine patterns underneath of the bark – because that’s the one smoking gun." Fletcher is a First Detector. That’s a recently organized group of citizen volunteers whose job it is to keep an eye out for invasive insects and educate the public on what to look for. State etymologist Jon Turmel says getting a handle on where the ash borer is once it arrives is important if there’s a chance of saving Vermont’s ash trees, adding, "If we’re able to determine where the focal point is, if it’s just a few trees we could take them down and retard its spread." 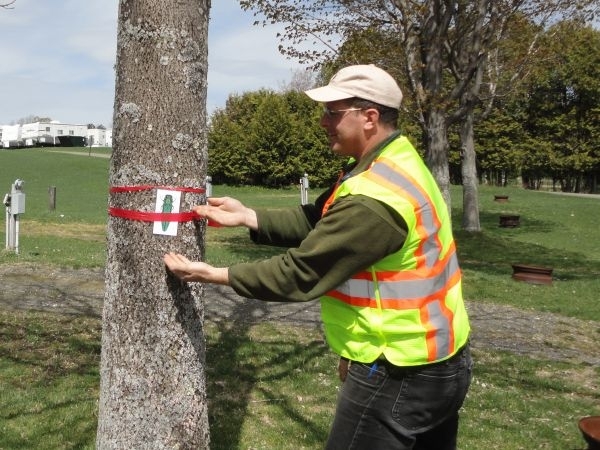 Turmel says there’s promising research being done on organisms that prey on the Emerald Ash Borer – so slowing its advance helps buy extra time. As they watch for any signs of the insect, officials are trying to make the public aware of how to keep it at bay. On Thursday, the parking lot of the command center was full of cars bearing bumper stickers that said, "Don’t Move Firewood. It Bugs Me."